July | 2013 | Does This Font Make Me Look Fat? My first book signing was in 1984 in front of a Walden’s Books in a Harford County (Maryland) mall. I sat behind a table with my book What’s Special About Our Stepfamily? piled in front of me. This local signing had been arranged by Doubleday, the publisher of my book. Note from Wikipedia…In 1988, Doubleday became part of the Bantam Doubleday Dell Publishing Group, which in turn became a division of Random House in 1998. In late 2008 and early 2009, the Doubleday imprint was merged with Knopf Publishing Group to form the Knopf Doubleday Publishing Group. In 1984 Doubleday had given me a $10K advance, and I was happy to do any marketing they arranged. That was back when there were more than six publishing houses and they actually paid you to write a book and you didn’t have to earn it back against royalties. It was also a time when publishers had marketing divisions which arranged book tours, etc. I was really looking forward to chatting with people and telling them about how the book came to be. Stepfamilies weren’t openly talked about then. People sometimes called them blended families. I wasn’t a blended mother, I was a stepmother and it was often a struggle. It wasn’t any easier for stepkids which is why I’d written the book. I just knew it was going to be a big seller! So there I sat. As the mall filled, more and more people walked past my table. I smiled, trying to engage, but they put their heads down and kept walking. Seriously, they wouldn’t even make eye contact. This went on for four hours. No one said hello, let alone bought a book. It was a lesson in humility and dashed expectations for this introverted writer. Fast forward almost thirty years to last December when friend and fellow writer, Brent Lewis, arranged for a book signing at Bridges Restaurant on Kent Island. There were five others signing and selling books: Brent Lewis, Kenton Kilgore, Jerry Sweeney, Robert Bidinotto, and Laura Ambler. The stepfamily book had long since gone to the shredders (another humiliating story) but I had my two romantic suspense novels piled in front of me. Laura was at my side and she had the children’s books for which she had done the illustrations. We didn’t have our joint YA novel, Big Skye Ranch, because it’s an ebook. Bridges is a restaurant with a lively bar. This is where the book sale tables were set up. I was drinking Coke, the high octane stuff with caffeine and sugar. For me, that seemed a better option than wine. A couple of glasses and I become a chuckle-head who falls asleep. But even without wine I can be a klutz so it wasn’t long before I knocked my Coke over. Fortunately we were able to pick up books before any were ruined, but now the table was sticky. Our waitress was great. She quickly wiped the table and we were back in business. People were talking to us and actually buying books. I asked the waitress for another Coke. She must have known who she was dealing with because this time my Coke was served in a sippy cup with a lid. Tip for Writers: only do book signings in bars. People buy more after a couple of glasses of wine! And ask for a sippy cup! Yesterday afternoon I met Laura at her office and we had a Skype session with our manager, Margie Farmer. On Monday night Margie met with fifteen people from the Liberty Showcase Theatre group who are in discussion with us about producing The Santa Diaries this Christmas. We were supposed to Skype with Margie on Tuesday, but couldn’t get through to her. I was worried. Turns out she was at the chiropractor’s office and today was Skyping from a recliner, her back on ice. When you Skype the video isn’t always synced with the audio, but being able to see the person you are talking to is so much better than a phone conversation. Margie said she enjoyed meeting the theater team and we are all hoping it will work out. They are community theater all the way – sponsored by the Owings Mills Recreation and Parks Council of the Baltimore County Department of Recreation and Parks. 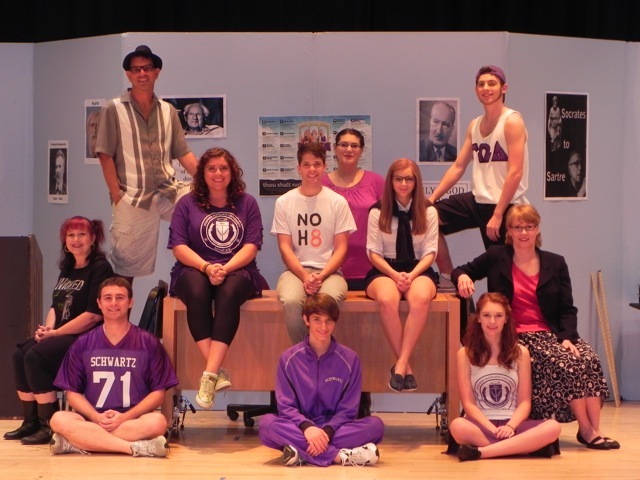 This summer they performed Godspell. Since our play is about the community created by community theater, Laura and I love the idea that this could be a true community production and collaboration. For many years our manager, Margie Farmer, was the head of the Music Department at Baltimore’s St. Paul’s School for Girls. In that capacity she worked on and produced many plays. She has a wealth of experience that will help us. For example, she suggested we prepare a Director’s Book which has the script, cast lists, music, staging suggestions, prop lists, and on and on. In future we can sell this to the people producing the play. She said she always bought the most complete Director’s Book available for any show she was doing and is going to send us examples. After our Skype session Laura and I spent time on line where we found the same Marley dog costume the Avalon purchased for their production. This information will go in the Director’s Book. 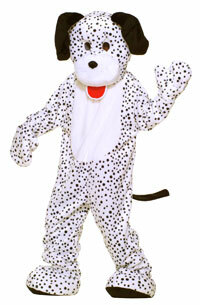 We liked the iconic look of the Dalmatian dog costume. It was big and bold on stage and the costume was only $125. Even a small theater can afford that. 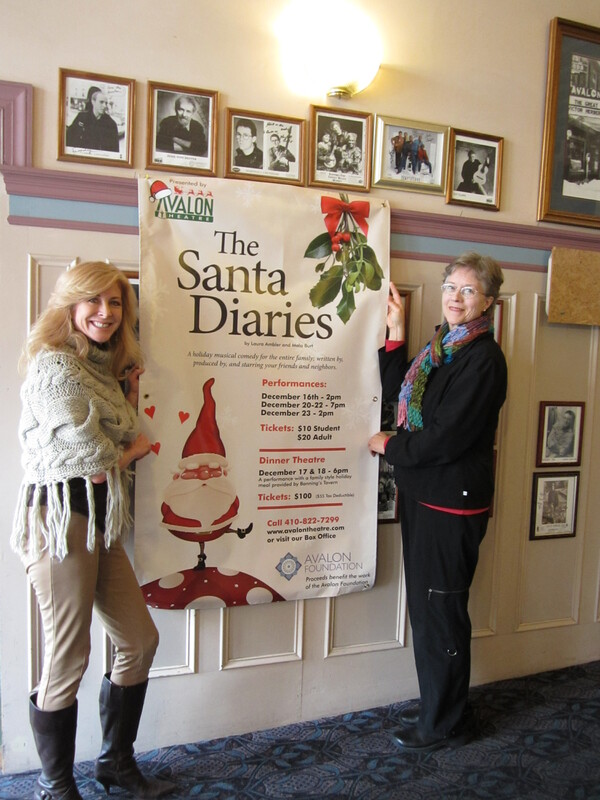 Our movie script for The Santa Diaries has been revised using all the terrific suggestions we got from our script consultant Dara Marks during out four hour phone consultation last month. Next week it goes back to Dara again and on August 14th we have our final consultation. Then we spend more time tweaking. In the meantime Laura has been researching where and how to send the script. The Santa Diaries will live on. When Laura and I work we spend the first five or ten minutes catching up. Yesterday I had a Whine I needed to get off my chest. It was about one of those volunteer jobs I am trying to give up. In order to do that, I have to teach somebody else how to do the job. I needed to whine about how it would have taken less time to just do the fricking thing myself, but that would have defeated the purpose of not having to do it at all next year! Okay, I feel better now. Laura’s update had to do with going the the Talbot County Fair last night. She said it was wonderful. It doesn’t take alot to get her excited. I, on the other hand, was mowing our lawn. You decide who probably had the better time last evening. 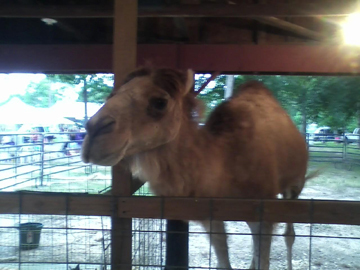 The high point of her night at the fair was reconnecting with Henry, the camel who does not spit. 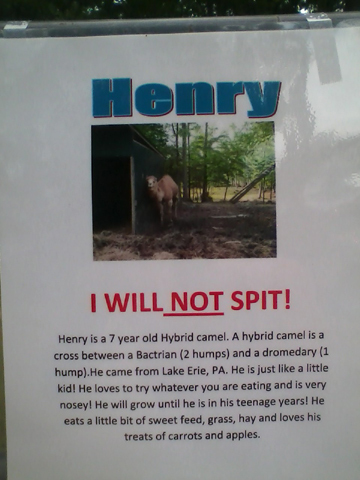 Laura met Henry last year at another fair and thought the sign “Henry Does Not Spit” would make a terrific log line for a script and did a blog post on that topic. She said there were two low points at the fair. The first was a deep fried Snickers bar. One of those little guys like you find in bags at Halloween, dipped in batter and deep fried. You should have seen her face when she described trying to eat it. I should have pulled out my camera. Laura is a real foodie; deep fried Snickers did not make the list. The other mistake she made was the going on a couple of those small town fair rides and what it did to her back and shoulder. She told me she’s on an ibuprofen diet for the next couple of days, but that didn’t take away from the joy of getting to pet Henry. He did not spit, bite or in any way misbehave. Henry lives on a horse rescue farm in Denton, MD. How this camel, a cross between Bactrian and Dromedary camels, got there is another story. 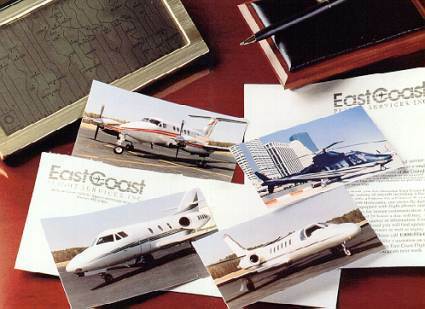 Laura’s day job is Executive Vice President of East Coast Flight Services, Inc., an executive air charter company based in Easton, Maryland. (They never get complaint letters.) However, the next time you want to send a letter of complaint, consider this. Laura found this letter online. She said it is a perfect example of how to look at writing differently – how flipping things on their ear can get people’s attention. The LIAT letter appeared in the British Virgin Islands newspaper, the BVI Beacon, earlier this year. The letter was written by Londoner Arthur Hicks and titled “An Open Letter to LIAT. I particularly enjoyed sampling the security scanners at each and every airport. I find it preposterous that people imagine them all to be the same. And as for being patted down by a variety of islanders, well, I feel as if I’ve been hugged by most of the Caribbean already. I also found it unique that this was all done on “island time,” because I do like to have time to absorb the atmosphere of the various departure lounges. As for our arrival, well, who wants to have to take a ferry at the end of all that flying anyway? I’m glad the boat was long gone by the time we arrived into Tortola last night — and that all those noisy bars and restaurants were closed. When Laura and I had our phone consultation with Dara Marks about our Santa Diaries script there was a moment when we were discussing how the movie script would end. It had to do with that “it can’t get any worse” moment. We brainstormed briefly and when we said, “Will (the main character) actually goes back to Los Angeles” we felt a surge of energy that was palpable. Dara commented on the difference in our voices and asked us to pay attention to this in the future. Two days ago when we were working towards the ending of the script we were struggling to figure out WHY Will would go back to LA. It had to be something momentous. More brainstorming. And then the energy surge and we knew his motivation. Pay attention to your energy when you write. You’ll feel the difference when the story goes where it wants to go, not just where you are trying to push it. Yesterday, when we were working, Laura remembered a movie she had seen called Doc Hollywood. She thought it had some parallels to the arc of our story. We searched on line for the script but couldn’t find it. Turns out the we could rent it for 24 hours on Amazon, so we watched it on my computer. We were able to track the places in the story where the first and second turning points happen – when transformation begins. We could tell that the page numbers in our script were right on target, especially at the climax – the last five pages. It was helpful to see how the movie handled multiple characters who had just a few scenes and minimal dialogue. These characters were memorable because they were very different and their dialogue smart and funny. 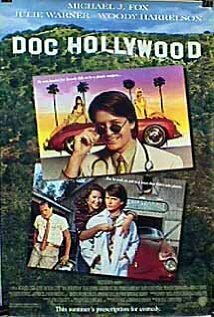 Doc Hollywood is not the world’s best movie, but we learned from watching it. Our movie script will be better because we took the time. We then went to lunch at Town Dock in St. Michaels and made an outline of what we needed to change in our script. We came back to my house and slugged in the sequence. Today we’ll begin to flesh out those changes, and in the process we’ll keep ourselves open to creative energy surges, no matter where they come from.